Esme Raji Codell wrote this book to tell about all the exciting events that occurred during her fifth grade year. In the introduction, Esme says that your our minds are like attics, and that memories are like paper; they can crumble and turn to dust, so we put them in boxes that get packed away. She found these memories in "boxes" her "attic," and she wanted to share them with us. 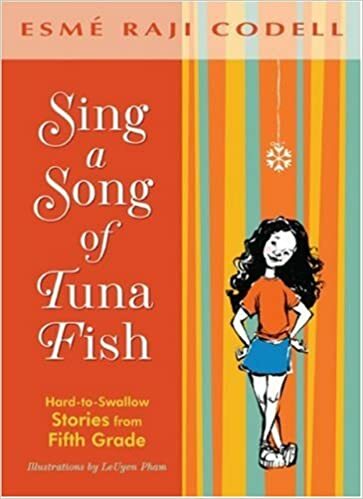 Sing a Song of Tuna Fish is a memoir, but unlike Three Little Words, a memoir I reviewed earlier, this book does not focus on tragic memories. Instead, it focuses on the times that had an impact for Esme, those memories that left a mark, often in funny ways. She tells about when she egged a car with her mother; a red Jaguar was parked in front of a fire hydrant near their apartment, and her mom didn't like it, so she had Esme egg the car from the balcony. She tells about the Chicago neighborhood she lived in, and talks about some of the stores, restaurants, and other places in the town, such as the local bakery, the laundromat, and the gift shop. In addition, she talks about her schooling experiences, her childhood thoughts about love, a party she and her cousin threw for their grandma, and a few other things. It's a little bit of everything. The book is like a journal of her per-teen life, and proof that even a "regular" kid's ordinary, everyday life is worth writing about. Her stories will make you smile. If you go back and read my review of Nothing, by Annie Barrows, the theme is similar. Ordinary kids actually lead pretty interesting lives, if they stop to think about it a little. Codell says that we all have these memories stored away in our mental "attic," and we just have to find them, and wipe away the dust once in a while. She goes up into her attic and dusts off some wonderful stories. Daddy's afterthoughts: I've heard tell that Esme Raji Codell does the reading herself for this book's audiobook, and that she imbues it with some real personality. This collection of vignettes is full of whimsy and some funny OMG moments. The perspective of a 10-year-old is good for that. She writes about her fifth-grade self, so the book targets that age range, I suppose (9 to 11), but I read the book and think that adults will warm to it as well. As YA memoirs go, it is not at all heavy and adult-themed like The House on Mango Street, but it still retains a sense of seriousness and sincerity even through the hilarity and silly bits, and there are discussions of mature topics that may stimulate conversation with younger readers like school life, love, money, and religion (Codell is Jewish, and much of the storytelling is infused with cultural references familiar to those of us that grew up in Jewish households; for others, perhaps somewhat less familiar). Codell provides lesson plans and discussion guides to accompany the book at: //www.planetesme.com/tunafish.html.